Water filter fitted to D35 Wilfried Oude Vrielink has fitted a water filter to the inlet side of the water pump on his Dehler 35. An image of this tidy modification can be seen in the Gallery. We have obtained a small supply of the ivory plastic hinges used on the heads lockers of some Dehler models. 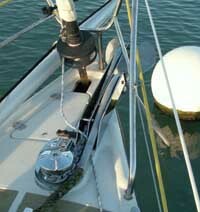 (See the gallery for the an example) visit yachtingparts to order. This is my one after I modified the standard anchor roller to add a second channel with it's own roller. Fits beautifully and looks great - and more importantly works well (as you can see) please if people want details - I am near Portsmouth UK and can point people at the guy who made this for me.